In an earlier post I bemoaned the paucity of my trips to Nice but I’ve recently been there on three consecutive days. These trips were courtesy of the last two stages of the Paris-Nice cycle race, and the presentation of Le Grand Depart of the 2020 Tour de France. The latter took place last Monday in the magnificent surroundings of the Nice Opera House, one of my favourite buildings in Nice. In the presence of a handful of ex and current riders, mayors of local towns, a small press pack and the great and good of Nice, the Mayor of Nice Metropole, Christian Estrosi – himself a keen cyclist – kicked off proceedings with a short film showcasing the splendours of the region to the converted. He handed over to Christian Prudhomme, the chap in charge of the Tour de France, who recalled Nice’s (limited) role in the history of the Tour. He also reminded everyone that there’s an exhibition celebrating “100 years of the Yellow Jersey” at Musee de Sport, Allianz Riviera until 29 September. The route of the two opening stages was left to Thierry Gouvenou, the race’s technical director, to explain and what a reveal! The 2020 Tour de France will start with a bang. Its organisers ASO have opted for two tough opening stages in and around Nice on roads I know well, love and regularly ride. The first will be a spectator-friendly 170km route suited to the sprinters and puncheurs, starting and finishing in Nice. Though it won’t be an easy route, with four tough climbs scattered along the way and a fast finishing circuit to conclude. 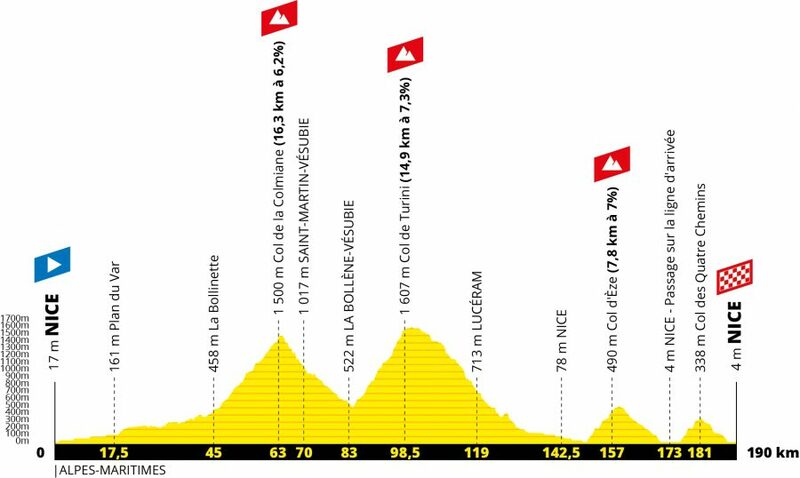 Stage two will be a major departure from traditional Tour de France openers as it heads into the mountains and reaches the highest point ever seen since 1979 (won by Bernard Hinault). The 190km route goes over four cols (3,700 metres/6500 ft), firstly the Col de la Colmiane and the Col de Turini, before cresting the smaller Col d’Eze then the final test of the day, the Col de Quatre Chemins, followed by the downhill run to the line on the Promenade des Anglais. 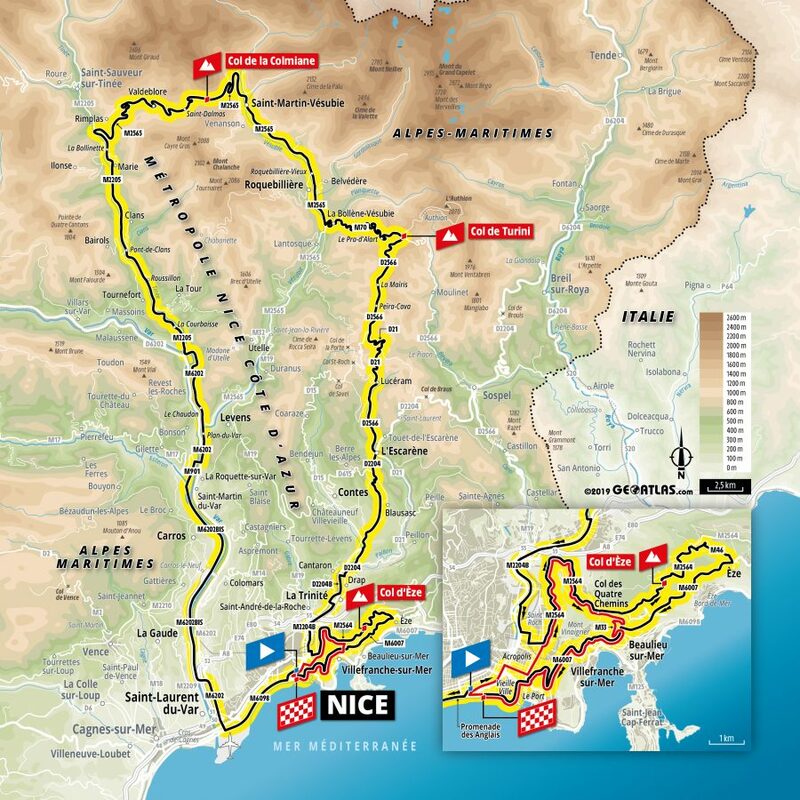 This stage, which again starts and finishes in Nice, is a mash-up of the last two stages of this year’s Paris-Nice, and will be a test for the climbers. It’ll also ensure that two different riders will wear the maillot jaune. Nothing was said about where stage three will start but I guess it won’t be too far from Nice. There’s always a chance that such an early test will take riders out of contention for the general classification while the race is still young. A traditional grand tour aims to build tension throughout its three weeks, culminating in a crescendo of final mountain stages, as the opportunities dwindle and contenders feel increasingly desperate to gain time on rivals. This rarely happens in the Tour de France. Throwing mountains up front isn’t usual for the Tour. Last year, the first uphill test didn’t come until stage 6, on the short Mur de Bretagne. Realistically, the stage is unlikely to do any real damage. The major climbs are far from the finish; the final two are short. Legs will be fresh. Teams will be strong. Sure, a few contenders will fail, but that always happens!